I was looking at the data plans for my MiFi 500 and clicked the link for the 4gb plan to see if it offered any discounts for a multi-month agreement. What I saw instead was a significant price increase. 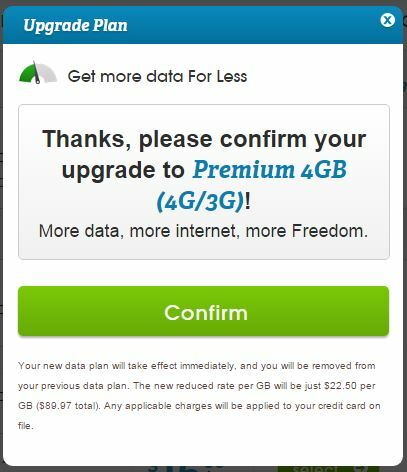 The price per month in the "Available Plans" page indicated 4GB would cost $29.99 per month. When I view the reeeeeally small text in the confirmation pop-up, I see a price of $22.50 per GB, for a total monthly fee of $88.97. First, $22.5 x 4 is $90. It seems the plans on that page need some adjusting? Are you sure that you saw $88.97 and not $89.97 ? The latter price would appear to be a 91 day charge of $29.99 per month. Several other plans feature a monthly price but charge 3x every three months. These are more discounted than the regular monthly offerings. I finally opened the graphic. It has $89.97. It never mentions the span of time, one month or three months. I suspect it is 3 months. I'd want more verification before making this purchase, though. Thank you Rich for your comments. I suspect it's just a typo but want to make sure before I sign up for anything. I'm surprised it still shows conflicting prices. "The new reduced rate per GB will be just $23.94 per GB ($11.97 total). Any applicable charges will be applied to your credit card on file." The price after the 500 mb is used up (which for all practical purposes is really closer to 400mb since you get charged around that point) is supposed to be $20.00 per gb but I want to make sure I'm not going to be charged $23.94 or $11.97 just for adding 3g access. Thanks.